Laura Cousins of Main Sponsor Stafforce Recruitment is presented with the Stafforce Club shirt by Chairman Rory Fergusson. Laura Cousins, the Regional Business Manager at Stafforce Recruitment, visited Nunholm recently. 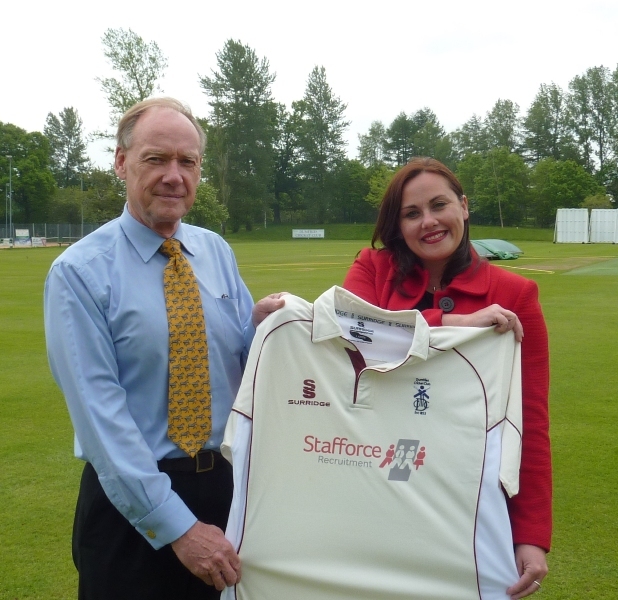 There she was presented with the company’s Dumfries 1st XI playing shirts by Club Chairman, Rory Fergusson. Stafforce Recruitment are the main Dumfries Cricket Club sponsors for the first time this season with the first team playing under the name Stafforce Dumfries. Stafforce opened their first office in Scotland, in Annan, in 2011 and are increasing their presence in the area and further afield in Scotland. Laura confidently predicted that the Dumfries shirt would soon be seen being worn round their Head Office by the company’s director, a cricket enthusiast.